We offer our guests not only a high standard of comfort, but also a restful enviroment in a quiet, safe and peaceful area. Enjoy nature with the sound of birds and unbelievable views, only metres from the superb golf course and mountain trails. We have 2 double bedrooms each with bathroom ensuite and 2 apartments and/or self-catering apartments (fully equipped). All rooms at Von Abercron Residence are spacious with either see or mountain views. Each room has been uniquely styled and equiped with everything where your every need has been catered for. Owners and staff are always open for your wishes. We are always at your service. 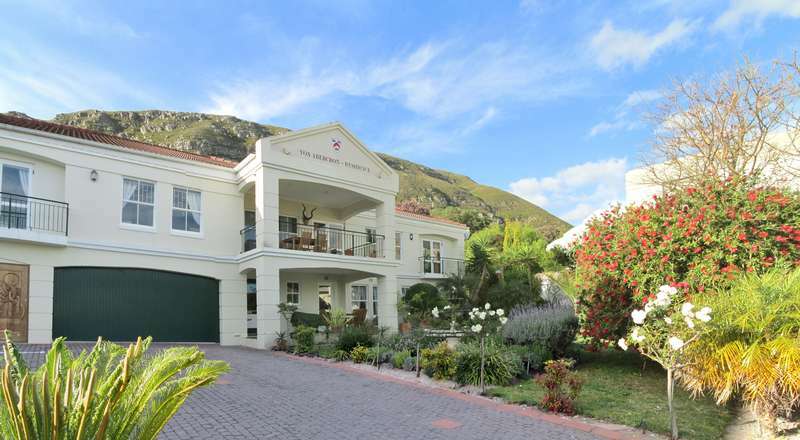 Directions to VON ABERCRON RESIDENCE Hermanus Accommodation from Cape Town. Take the N2 from Cape Town towards George. Pass over Sir Lowry`s Pass. Drive straight pass Grabouw towards Botrivier whitch is about 30.7km Sir Lowry's pass . After passing over the Houw Hoek Pass turn off to Hermanus R43 to your left. When entering Hermanus via the Main Road, at the Total Petrol garage (Gateway Centre) turn into Mountain Drive and follow the road all along the mountain. At the T-junction turn left into Jose Burman Drive. Continue on this road to the next T-junction. Turn left into Fernkloof drive and continue on this road for at least 1km. Turn left at 75 Fernkloof Drive, you are now facing Von Abercron Residence. Alternately continue down the main road untill you get to the first big traffic circle. Turn left into Royal Street untill you get to the 2nd big traffic circle. Turn left into Lord Roberts Street and continue till the end of the street. At the T-junction will be a visible road sign ``Von Abercron Residende``. Turn right into Jose Burman Drive. Continue on this road to the next T-junction. Turn left into Fernkloof drive and continue on this road for at least 1km. Turn left at 75 Fernkloof Drive, you are now facing Von Abercron Residence. Refer to Map (Bottom) for route details. We wish you a safe and happy journey. A prepayment of 50% is required to secure your booking. Please note that our rates are subject to change without prior notification. Check in time is from 2pm and check out time is 10:30am.